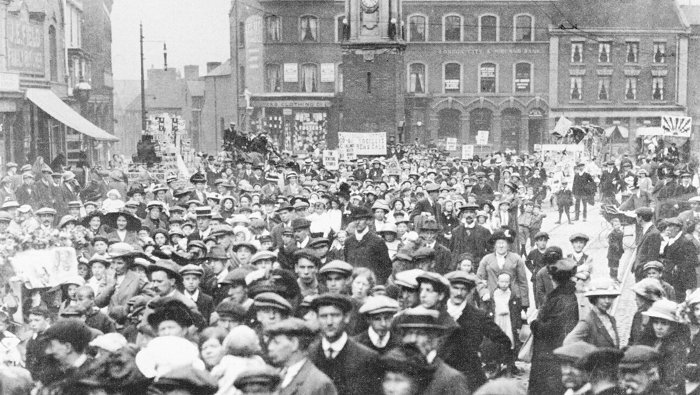 Crowds gather in the Market Place for the 1914 Wednesbury and District Co-Operative Society Gala. From an old postcard. 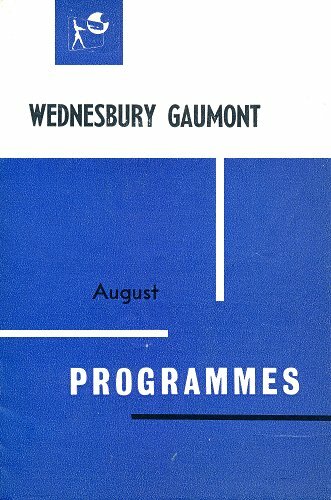 Wednesbury town centre had a wide variety of shops, selling all kinds of products, foodstuffs, and offering a considerable range of services. 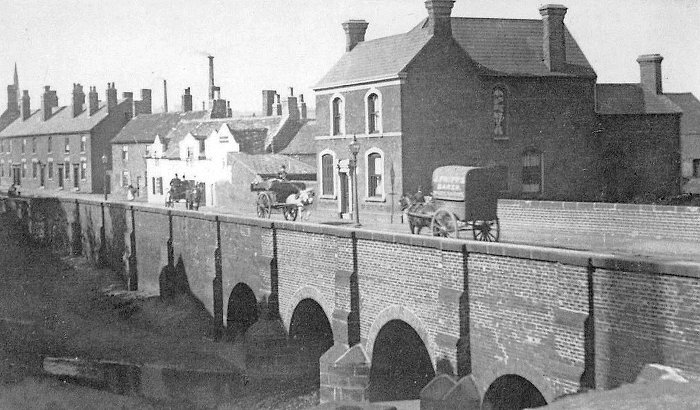 It is hardly surprising that it became popular with the local population, especially as the town had an excellent market, and was well served by the South Staffordshire Tramways Company Limited. What follows is a brief description of some of the well-known shops and businesses that thrived in the town during the first quarter of the twentieth century. The shop, which stood on the corner of Union Street and Market Place first opened for business in the mid 1860s. It was originally run by Mr. L. B. Longmore, and later by his son, Mr. F. V. Longmore. Mr. Brown, who took the business over around 1912 was a gentleman’s outfitter and specialised in hats, socks, woollen items, shirts, and gloves. The shop had three large display windows, and was popular with the local male population. Other stocked items included silk and felt hats in the latest styles, panama, and soft hats, juvenile caps of every description, good class hosiery and underwear, ties, scarves, collars, and cuffs etc. Shirts were made to measure, with the guarantee of a perfect fit. Browns were agents for Dr. Jaeger's pure wool underwear, and Aertex cellular clothing. Items were always economically priced. 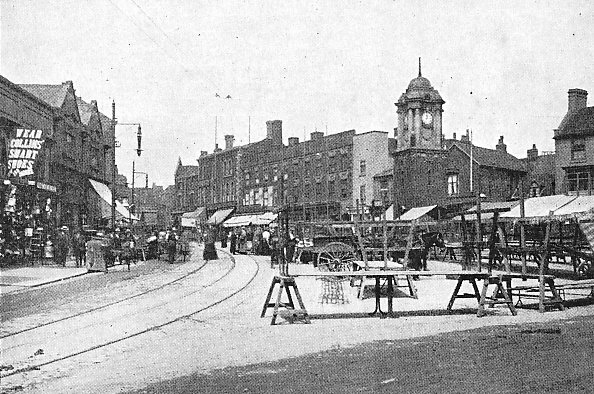 The Market Place in 1915. A very old established coal and coke supplier, founded by Mr. W. Charles in 1879, and later run by his son, Mr. Frank Charles. The business had a high reputation and absorbed a large share of the trade in the district. All kinds of best household coal was supplied in cart or truck loads, and manufacturers were supplied with furnace, steam and other coals, and coke, or slack etc. Mr. Charles was the sole agent in the district for Brereton coal, and all kinds of Cannock, South Warwickshire and South Staffordshire products. General haulage contracts were undertaken, and an adequate number of light or heavy vehicles were available for the purpose. 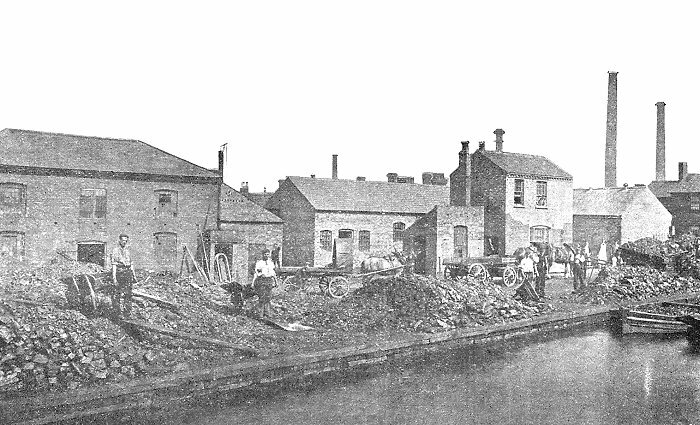 W. Charles' Wednesbury Bridge coal wharf. Mr. Arthur H. Coney founded the business in 1903. The shop had a large display window, and contained a large amount of stock, and several workrooms. Mr. Coney was an accomplished tailor, who used the newest and most fashionable patterns. He catered for both ladies and gentlemen, and guaranteed a perfect fit, and superior finish for each garment. He specialised in the making of breeches, and offered competitive prices. His aim was to give complete satisfaction to each customer. Mr. S. Hickinbottom was well known for the high quality products produced at the Electric Bakery, which were unsurpassed for purity, sweetness, and digestibility. The business was founded in the late 1890s in Lower High Street, and moved to Victoria Street in 1905. The bakery was equipped with the most modern and up-to-date machines and plant to ensure a high standard of quality. Mr. Hickinbottom conclusively proved that machine-made bread could be produced to rival the best homemade varieties. He also made all kinds of cakes, scones, buns, pork pies and general confectionery, which were described as unsurpassed dietetic dainties. His carts and vans delivered daily throughout the town and the surrounding districts. His products were widely recommended, and sales steadily increased. This popular business was founded around 1904. Sidney Jowett was regarded as one of the most reliable and enterprising representatives of the trade to be found anywhere. He was known for offering only the most reliable and best quality goods at the lowest possible prices, ensured by his exceptional purchasing facilities in the best markets, and a large turnover. The premises was known as Market Stores and supplied all kinds of fruit in season, fish, poultry, rabbits and flowers. Jowetts specialised in the making of wreaths, crosses, bouquets, gent's button holes and ladies sprays. 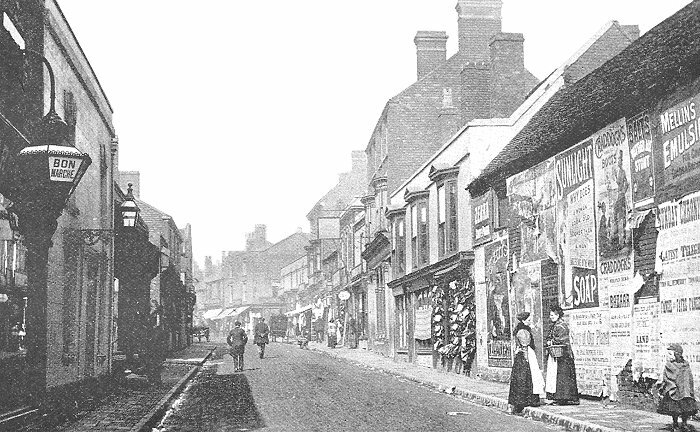 The shop of Misses M. & J. Lillis was one of the most popular and important business concerns in Wednesbury. It began trading in 1859 and occupied a prominent position in Lower High Street. It became very popular with lady residents of the town and surrounding districts, and continually featured attractive displays in the shop windows. A range of fashionable and first class stock was always available, including a wide variety of baby linen, and shawls, and specialities such as ladies blouses, corsets, laces, gloves, umbrellas, hosiery, aprons, neckwear, and underwear. All the usual lines in haberdashery and fancy drapery were stocked, and the business gained a high reputation for its quality items. An advert from 1917. Mr. W. A. Page had an extensive business in both the wholesale and retail tobacconist trade. He started in Upper High Street in 1905, and opened a second shop in Market Place in 1910. He stocked all the leading brands of tobacco, cigars, and cigarettes, and all makes and kinds of pipes, cigar and cigarette holders. He also supplied pouches, cigar, and cigarette cases, and a wide range of smokers' accessories. He supplied publicans and shopkeepers throughout the area, and was known to be very reliable. The Market Place. From an old postcard. Both shops were established in the mid 1880s and later acquired by Mr. Powell, who had gained a lot of experience in the trade. Both shops had a good frontage, and carried a large stock of ready to wear clothing. It was usually possible to find something to fit every customer, ranging from moleskin or hard wearing clothes, to best wear. A large trade was done in boy's school and best suits in all sizes, for all ages. The tailoring department was noted for the style, fit, and finish of all garments made to measure, and the lowest possible prices were charged. A fine range of patterns, of all the newest materials and fashionable shades was on hand, and the best workmanship and most careful attention to detail was always carried out. Hats of all kinds and of the latest fashions and shapes, together with caps, shirts, pants, hosiery, neckwear, and all articles of gents outfitting were on offer. Mr. Powell was chairman of the Wednesbury Tradesmen's Association. 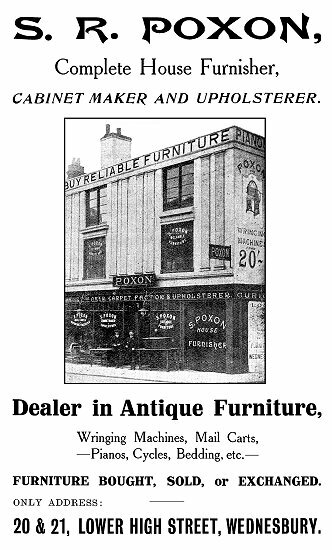 Mr. Poxon's business occupied a prominent position in Lower High Street and carried a comprehensive stock of household furniture and furnishings, the widest selection available in the town. The business was founded in the late 1890s and had large show windows and showrooms. The staff included extremely experienced upholsterers, cabinet makers, and repairers who worked under Mr. Poxon’s personal supervision. 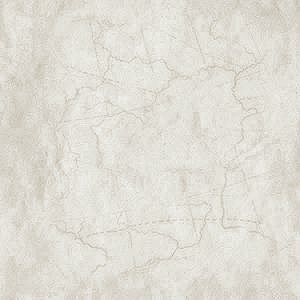 A good stock of floor coverings, carpets, and linos were available, all at very reasonable prices. Mr. Poxon also stocked wringers, mail carts, pianos, and antique furniture. He purchased second-hand furniture and had an exchange scheme for any kind of furniture. An advert from 1917. The large and popular drapery and furnishing establishment of Mr. F. W. Preece occupied a good central position in the Market Place. It is an old business, founded in the early 19th century by the Dawes family, who ran it for around 100 years. 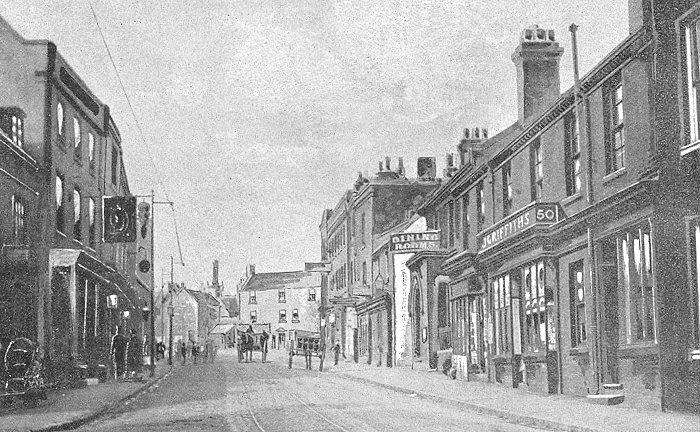 Mr Preece took control in 1904 and extended and altered the premises to meet a great increase in business. The spacious shop had a large window, with stock, and showrooms on the upper floors above. Stock included general furnishing, linen and fancy drapery, ladies dresses, skirts and blouses, material, outfitting goods and hosiery for ladies, girls and children, lace, trimmings, silk and satins etc. Furniture included beds, carpets, lino, oilcloths, rugs, curtains, blinds, and drapery etc. The management prided itself on a prompt and polite service, offered to all customers. Mr. A. Strickley was known as one of the most reliable grocers in the area. He founded his business in 1880 in the well positioned corner premises with good display windows, and ample room for storage. He stocked a wide range of items, all of the highest quality, including ham, bacon, butter, tinned and bottled specialities, tea, and Italian warehouse goods. Every Christmas a very fine show was made of seasonable goods, and crackers, etc. Orders were regularly called for, and delivered in Wednesbury and the surrounding area. Mr. Strickley had been in the business all his life, and had previously worked at some of the largest firms in Birmingham and the district. Mr. Sidney Webb was well known as an undertaker throughout much of South Staffordshire. 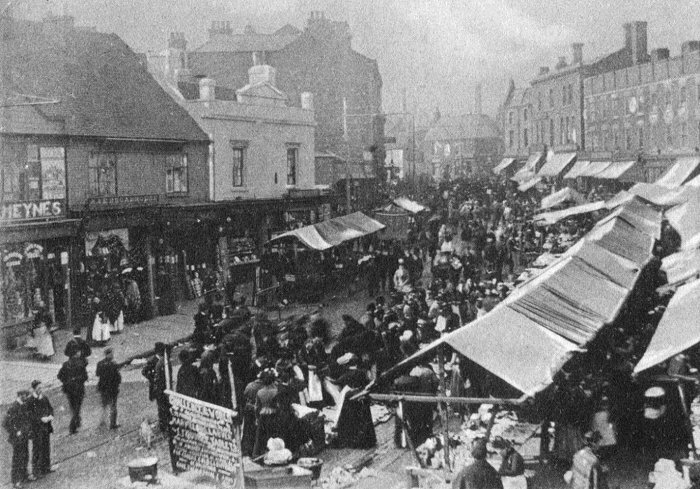 The business, which was one of the best organised and most popular, was founded in the mid 1890s, and moved to Upper High Street around 1900. The premises, which is still in use today, was very extensive for the time, and had a showroom at the front, and a large mews and taxi garage at the rear. Sidney Webb owned first class horse-drawn hearses, a motor hearse, and a good number of new and excellently upholstered horse-drawn funeral carriages. He carried out funerals in their entirety, in any part of the district, and gained a reputation for moderate charges and carefully planned arrangements. He ran his taxi garage on up-to-date lines, and owned a number of well appointed cars for hire, both during the day, and at night. The Old Theatre Royal in Earps Lane opened in 1860. It closed in 1883 and was purchased for use as a citadel by the Salvation Army. In 1905 they moved to a new citadel in Upper High Street and opened a second barracks in Crankhall Lane. 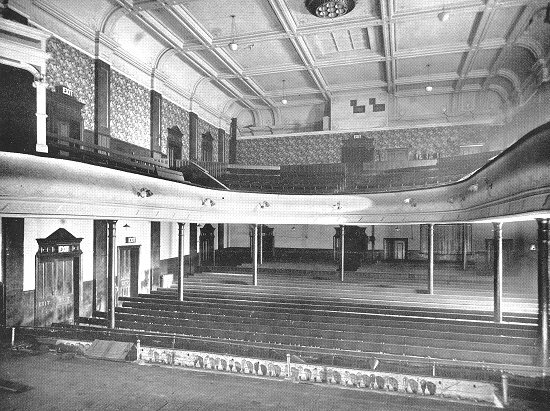 In 1909 the theatre reopened as the King’s Hall, a variety theatre and cinema which would have a checkered career. After renovation in the 1920s, it reopened again, this time as the Rialto Cinema. After the reopening in October 1927 it had a short life, remaining in business for just over three years. Yet again the building was renovated, and extended, and the facilities were improved. After reopening in September 1931 it would again have a short life. This time it survived for around six years, to be renovated yet again, with the addition of a new imposing front to the building. After reopening in August 1938 it had its longest unbroken run as a cinema, eventually closing in April 1957 as a result of declining audiences. After redecoration it reopened yet again in November 1958, and continued in use as a cinema until July 1961 when it became a bingo club. It remained in business until about 1970 when it finally closed. 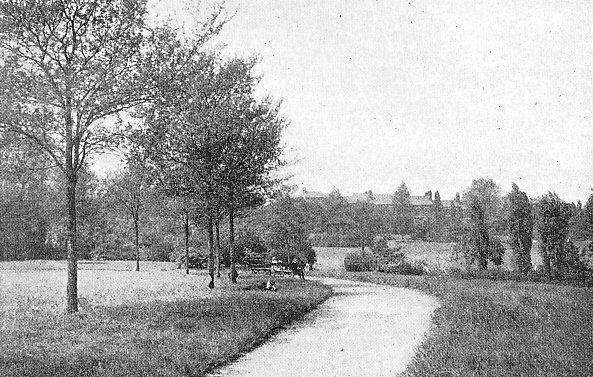 At the time the area around the High Bullen was being redeveloped and the new dual carriageway built. The building finally met its end in 1973 as part of the redevelopment. It had a parquet floor, an orchestra enclosure, licensed bars, a bill room, stores, and manager’s office. In the early years of the twentieth century Professor Joseph Wood and his son Thomas began to visit the theatre with their travelling film show. The films were shown between variety acts. 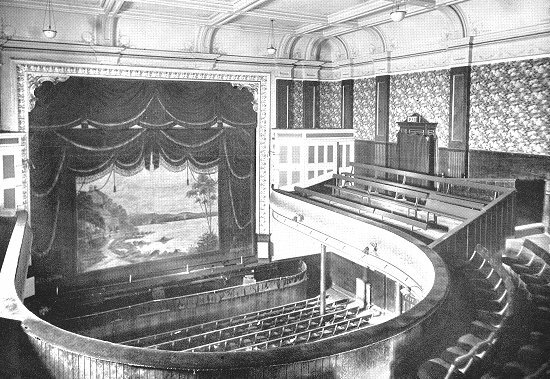 It became the Hippodrome in 1910 and a cinema box with two projectors was installed at the back of the circle. It was later owned by local businessman Hubert John Barlow, of H. J. Barlow & Company, a nut and bolt manufacturer at Mounts Road Works in Bridge Street. He became Mayor of Wednesbury in 1931, and ran H. J. Barlow’s Repertory Company. During World War 2 the theatre was used as a British Restaurant. 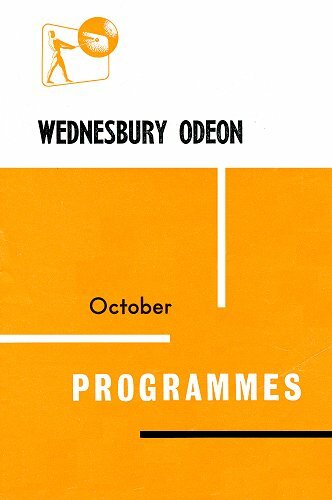 In the 1950s films were shown at the beginning of the week, followed by plays and productions at the end of the week. The Hippodrome closed for the last time in April 1959 and was demolished in the 1960s. "My parents took me there in about 1953 from nearby Walsall, my mother came from Wednesbury. It was a general variety show but part of the way through, a lady said 'I now have some poses for you'. She certainly had, the curtains closed and reopened and there she was, starkers, kneeling down with an elaborate candlestick in each hand held aloft. She did several other poses but I don't think my embarrassed parents knew what to say." A second cinema opened in Upper High Street on Monday 7th October, 1912 called the Imperial Picture Palace. The cinema, run by the Wednesbury Imperial Picture Company became known as 'The Imperial' and also 'The Palace'. Like the Hippodrome it was designed by C. W. D. Joynson. The cinema had an elegant facade, a carpeted floor, and tip-up seats which were arranged so that everyone in the audience had an unobstructed view of the screen. The opening films were 'The Man of the Wilds', and 'Relief of Lucknow'. 1931 saw the introduction of sound, a full two years after the talkies came to The Picture House, and a year after sound equipment had been installed at The Rialto. The cinema remained in business until May 1937 after which it was extensively modernised and extended to accommodate 1,200 people. It reopened on 27th September, 1937 and was quite successful until audiences started to decline in the 1950s. It became a bingo hall in the first few months of 1961, but closed in December of that year, and was demolished in 1964. Another cinema, the only one of the old cinemas to still survive, opened as The Picture House, in Walsall Street on 25th March, 1915. It remained in business until January 1938 when it closed, and was rebuilt as a modern, state of the art cinema accommodating 1594 people. The new cinema, now called the Gaumont, opened in October 1938 and was a great success. On 9th March, 1964 it became the Odeon and continued to be successful for several years. In January 1972 the cinema was acquired by the Silver Cinema Company Limited to show English language films on weekdays and Saturdays, and Indian films on a Sunday. It became known as ‘The Silver’. 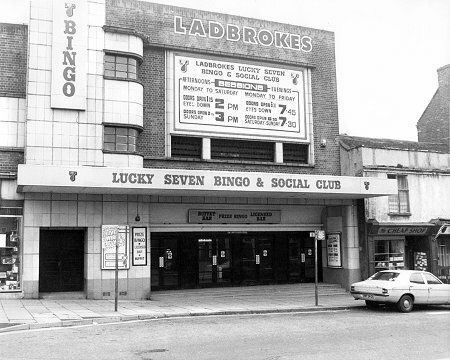 In 1974 the cinema was purchased by Ladbrokes and opened as a bingo and social club, and was later taken over by Walkers to become Walkers Bingo & Social Club. For many years it was extremely successful with more than 1,500 members and 4,000 visitors each week. By the early years of this century it was finding it difficult to compete with the larger bingo chains, and visitor numbers plummeted to around 800 people per week. It closed at the end of February 2010. Bridge Street and the bridge over the River Tame.